The Traffic & Safety Committee worked very hard last year with our City Councillor, Jaye Robinson, City Staff, and the Lawrence Park Road Safety Committee to make these changes for the safety of our children. These changes were approved at North York Community Council in July 2018. We hope the new signage will be in place on the first day of school, but it’s possible that it may take longer to get the new signs in place. Blythwood continues to be at capacity with the whole school (including JK & SK students) being dismissed at 3:30pm. This makes for a high volume of parents and caregivers arriving at the same time to deliver and/or collect their children. At Blythwood P.S., there are dozens of vehicles arriving to drop-off and pick-up children every day. By driving our children all the way to school, we are contributing to dangerous traffic conditions – at times putting our children at risk. This is particularly evident in winter months as snow and other hazards make for extremely congested and difficult drop-offs and pick-ups. In addition to some changes near the school, all local streets in Lawrence Park will have the speed limit reduced to 30 km/hr. Hopefully this will make walking to school a bit safer. Also, watch for changes to the intersection of Mt. Pleasant and Blythwood Rd. We are expecting a left-turn lane to be added for westbound cars turning south on to Mt. Pleasant. We have also ordered some orange flags to help pedestrians cross Mt. Pleasant. It is important for pedestrians to carefully watch for turning cars at this busy intersection. In response to your overwhelming desire to establish a safer traffic environment around the school, we have outlined some safety guidelines we expect everyone will adopt. We have also included many suggested alternatives to driving that will improve the flow of traffic at pick-up and drop-off. We ask you to remember that we are models for children’s behavior and must set a good example as pedestrians, cyclists and vehicle drivers. Please review the traffic safety regulations outlined below. *NEW* In September, parking in front of the school will be illegal during drop-off and pick-up hours. 15-min parking will be allowed from 9am – 3pm, Mon-Fri, allowing for quick pick ups for sports, doctor appts, etc. Stopping briefly to drop-off or pick-up a passenger is legal and encouraged, similar to how traffic flows at an airport. If your child is not ready when you pull up, we ask you to circle the block or park on a side street and walk. Leaving your vehicle unattended is NO LONGER legal during drop-off and pick-up times. Parking greatly contributes to our double-parking problem. Double parking is extremely dangerous and puts children at risk. It forces kids onto the road and makes them vulnerable to other cars trying to leave. It also obstructs the visibility of other drivers and pedestrians. In order to prevent double-parking, we need to keep space in front of the school as clear as possible. 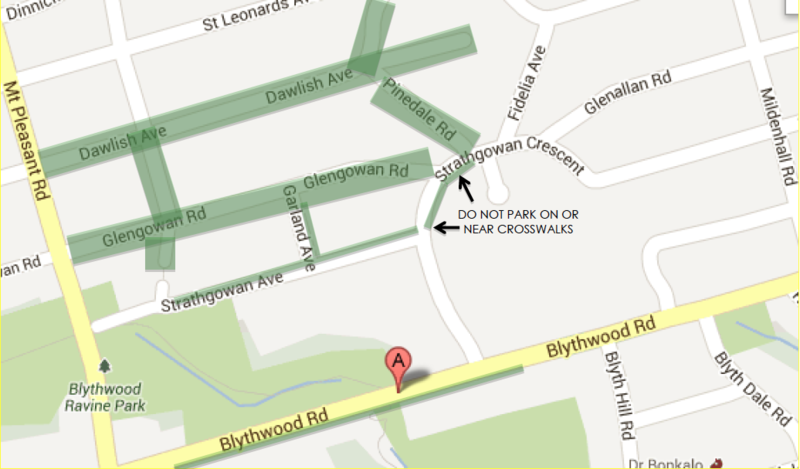 *NEW* No U-turn signs will be posted on Strathgowan Cres in front of the school. Driving into residential or other driveways and then backing out to change direction is also not recommended. It is difficult for drivers making a “U” turn or backing up to see small children crossing the street. 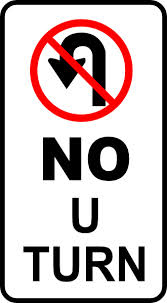 “U” turns can be confusing for children as they may not be able to anticipate such irregular vehicle movements. Additionally, “U” turns and 3-point turns interrupt the flow of traffic and cause further congestion. Please refer to the map on the next page to see proper traffic flow. Do not pick-up or drop-off children against the flow, forcing them to walk across the street. This practice is NOT safe and is an accident waiting to happen. 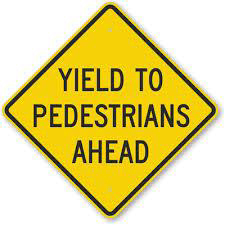 REGULATION: YIELD THE RIGHT OF WAY TO PEDESTRIANS AT ALL INTERSECTIONS AND CROSSWALKS. 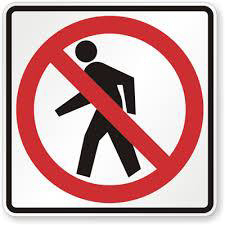 Cars must yield to pedestrians when they are walking on a roadway with no sidewalks. Drivers must also follow the directions of crossing guards when present. 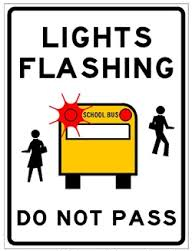 REGULATION: DO NOT PASS A SCHOOL BUS WITH RED LIGHTS FLASHING. Children’s ability to perceive traffic danger is different than adults. Drivers need to be extra cautious when driving near a school as children may enter the roadway suddenly. Respect the speed limits and prepare for the unexpected! 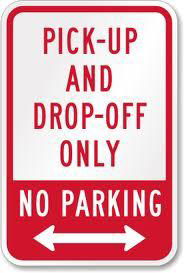 Respect all signs that outline safe pick-up/drop-off practices. These have been designated to provide clear visibility for pedestrian crossing guards, and for emergency vehicles access to the school for sick or injured children. Respect crosswalks! Never stop, back-up or park vehicles on or near crosswalks. This creates visibility problems for motorists and pedestrians at the crossing. Drop children off on the curbside; do not let them open the car door into a traffic lane. Always drop a child off on the school side of the street. It is illegal to drop or pick up your child on Strathgowan Ave on the driver’s side since this is a 2-way road. Never beckon a child across the road to your vehicle.Children must never cross the road mid-block. Drive lawfully, calmly and without distraction.Your child will drive one day too. HOW CAN WE WORK, AS A COMMUNITY, TO KEEP EVERYBODY SAFE AND HAPPY? 1. PARK AWAY FROM THE SCHOOL AND WALK. To avoid congestion, park legally on a street away from the school, facing the direction of your next destination. Then walk to school. This saves time and the stress of being caught in traffic and reduces the number of cars at school, creating fewer conflicts between child pedestrians and vehicle traffic. Please see the map below, which outlines all legal parking in and around our school. Green indicates where parking is allowed during drop-off, lunch and pick-up times. 2. WALK WITH YOUR KIDS AND ENCOURAGE OLDER KIDS TO WALK OR BIKE. 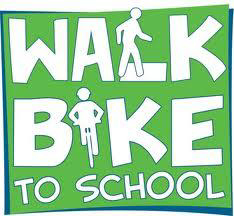 Research shows that kids actually love to walk and bike to school! In older children, it fosters independence, promotes physical activity and is environmentally friendly. Walking with friends or as part of a “buddy” system makes it fun. We are a neighbourhood school and are fortunate that most houses are within walking distance to the school. We encourage you to map out a safe walking or biking route with your child in preparation for the fall. While we recognize that it isn’t always possible to walk, please consider building it into your routine where possible. Walking school buses are a great way for communities to work together to deliver younger children to school safely. Many of our neighbouring schools have successful walking school bus programs. Talk to your neighbours and set a schedule where parents or caregivers alternate taking a small group of children to school. The kids can socialize and will love it! We also encourage you to look for carpooling options, particularly for after school programs. Many families end up driving to the same programs and some duplication could easily be avoided with carpooling. It may even free up more of your own time! If you must pick-up quickly due to after school commitments or multiple pick-ups, consider setting an alternate pick-up spot. Setting a spot, even one block away, will save you the frustration of navigating school congestion and empower your child. Please take advantage of this great program. In the fall, we hope to add a few more volunteers to Kiss ‘N’ Ride to help shuttle younger children (Grade 1) around the back to the south doors. We hope this alleviates any parental concerns over your children safely entering the school. Another program to take advantage of is “The Supervised Playground”. A Blythwood staff member will be on yard duty daily from 8:35-8:50 am for early drop-off. We are adding supervision after school from 3:30 – 3:45 pm. The staff member will do a sweep of the grounds and supervise children until 3:45 by the hockey pads. If you aren’t rushing somewhere after school, this is a great way to avoid peak traffic. Kindergarten students are required to be picked up directly by a parent or caregiver (special permission can be granted to an older sibling as well). 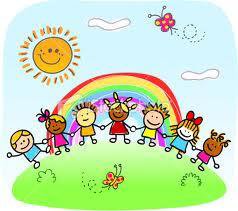 In the fall, Kindergarten students will have outdoor afternoon recess starting at 3:10 pm. If you are concerned about traffic and need to pick your child up by car, you can park near the school and pick your child up in the school playground when the bell rings at 3:30. THE REAL PENALTY FOR NOT OBEYING TRAFFIC REGULATIONS IS THAT YOU MAY JEOPARDIZE THE SAFETY OF CHILDREN AND OTHER ROAD USERS. BE THE RESPECTED ROLE MODEL YOU WANT YOUR CHILD TO LEARN FROM. 7 − 6 = ?